Wilde helped IMI Yorkshire Fittings – a leading manufacturer of fittings to the plumbing and heating industry – improve extrusion process design by perform cold forming simulations and die stress analyses. The first process was an existing manufacturing operation that ran satisfactorily. The second process was designed to produce a longer workpiece section but in service was experiencing early die failures. It was proposed to use FEA software to investigate the differences in the die stresses generated by the two processes to identify potential reasons for early failure. The models comprised the workpiece to be formed and a multiple die assembly including carbide and steel components (right). A non-linear forming simulation of each process was run for the complete extrusion of the workpiece. As the forming loads varied during the process, a series of die stress analyses were performed at different stages to locate the maximum levels and changes in stress. Each analysis modelled the combined stresses due to the interference fit between the carbide insert and steel casing, and the applied forming pressures. The simulations predicted a tensile axial stress near to the throat of the insert due to the interference with the steel ring. 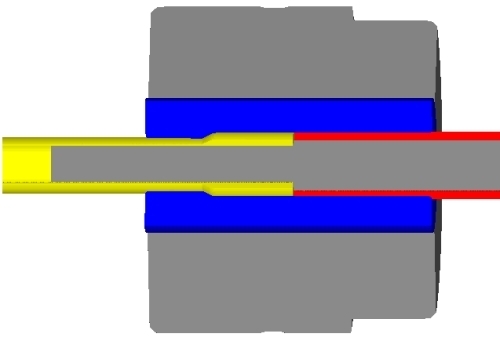 These tensile stress were shown to be approximately 25% greater in the modified dies than in the original dies, potentially leading to a reduced operating life. In addition the predicted forging load for the modified process was found to be approximately 50% higher than for the original process. Further simulation work was carried out for the company to assess the performance of a subsequent tube extrusion process. It was predicted that any damage to the workpiece generated by the tube extrusion process, as measured by the normalised Cockcroft and Latham ductile fracture criteria, would not be significant. Furthermore the simulation did not indicate any significant over sizing of the internal bore due to this process. The results of this simulation reduced the company’s concerns over the consequences of adding this process to their manufacturing operations.